The correct size for most well water and pressure booster tanks (also called hydropneumatics tanks) can be calculated by simply answering two questions: how much water do you need to store and what is the range of the pressures allowable for the water (minimum and maximum pressures)? The amount of water stored in a vessel between high and low pressures is commonly called “drawdown” and the high and low pressures are dictated by the size of the tank’s air cushion. 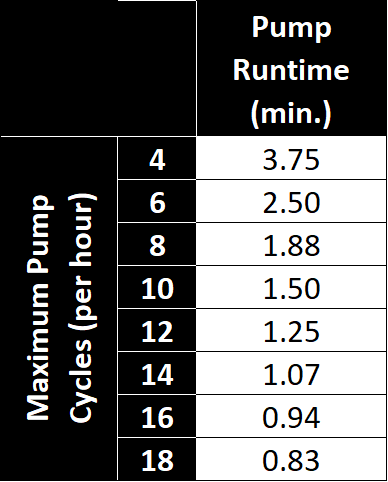 Sometimes, a design engineer will state a maximum number of pump starts per hour and then divide 60 minutes by the number of allowable cycles per hour to get the pump run time. However, this false assumption will result in a tank that is excessively oversized. 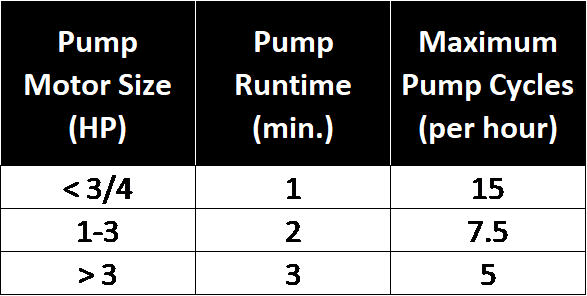 The following chart reveals the pump capacity multiplier needed based on the maximum number of allowable hourly pump cycles. Once you’ve determined your tank’s total gallon requirement, simply cross-reference that number with a list of hydropneumatic tank volumes to determine the right tank for your application! Please note: the preceding sizing is based on constant flow pumping systems where the function of the tank size directly relates to pump motor protection. Sometimes, there are systems with variable frequency drive (VFD) pump motors or tanks used to store water to aid the pump’s capacity or provide deliverable storage during an electrical brown out. These systems and their associated sizing will be discussed in future installments.